Manual Tire Changer Floor Mount Ken Tool T601 / BOWES KT T601. Mounts and demounts a full range of tires on rim diameters from 4 to 15 inches. Tapered bearing guide positively centers straight shaft hubs of all diameters. A built-in, infinitely adjustable bead breaker works on rims up to 15" in diameter and 24" in width without disassembly. 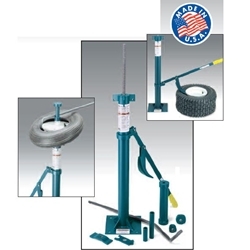 Includes a Ken-Tool exclusive, 28" Tire Snake® mount/demount tire tool. Patented.